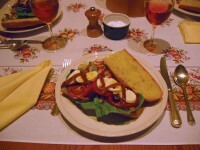 This wonderful summertime French sandwich is quick to make and fun to eat. Here is my adaption of a recipe I found on www.epicurious.com. Try it, you’ll like it! To prepare the onions, combine the onions in a bowl with the olive oil, vinegar, sprinkling of salt, and several grinding of black pepper. 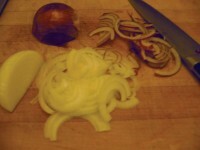 With your hands, mix and queeze the onions together for 3 minutes so that the onions release their juices. 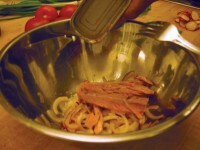 Mix in the tuna with lemon juice to taste. 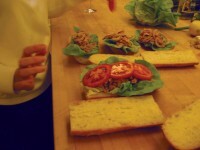 To make the sandwich, cut the baguette in to 4 pieces; cut each piece in half lengthwise. Take out and discard some of the crumb in the bottom halves. Layer the sandwich as follows, first lettuce slices, then the tuna mixture, then the slices tomatoes, then the hard-cooked eggs. Sprinkle with salt and pepper. 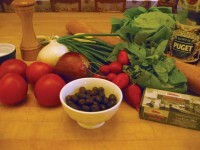 Scatter over the olives and crisscross with anchovies. 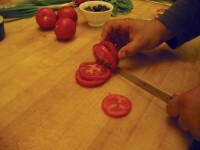 Before serving, drizzle additional olive oil inside the top halves.